Ready to Print app – A pre-writing app for the iPad (9.99). Diane Reid, Occupational Therapist, created this pre-writing app as a supplement to develop the foundational skills of beginning writers. There are few such apps out there that truly provide visual motor activities in a developmental sequence and provides options to change settings within the activities as this Ready to Print. Also provided is the ability to create multiple users and track data on each user for assessment data – very handy when progress notes and annual IEP review time comes around! Ready to Print app progresses through pre-writing skills in a specific order, so that children can master the visual-motor, visual-perceptual, and fine motor skills necessary for correct printing patterns. It is designed to teach children the correct patterns for printing, and to avoid bad habits that are difficult to change as the child gets older. Provides activities for pre-writing skills. Designed with a progression of skills that work towards correct printing patterns. 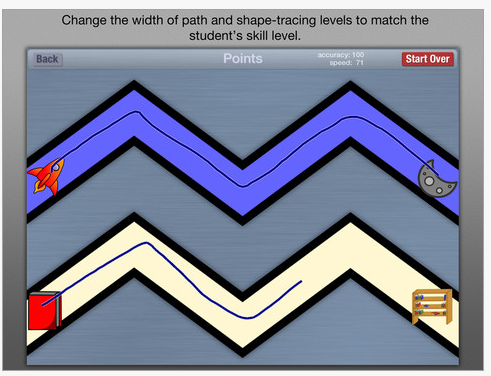 Allows change of size settings to match each child’s skill level. Features a progression from larger hand movements to smaller, more refined movements. Allows setting up multiple user profiles, each with different settings. 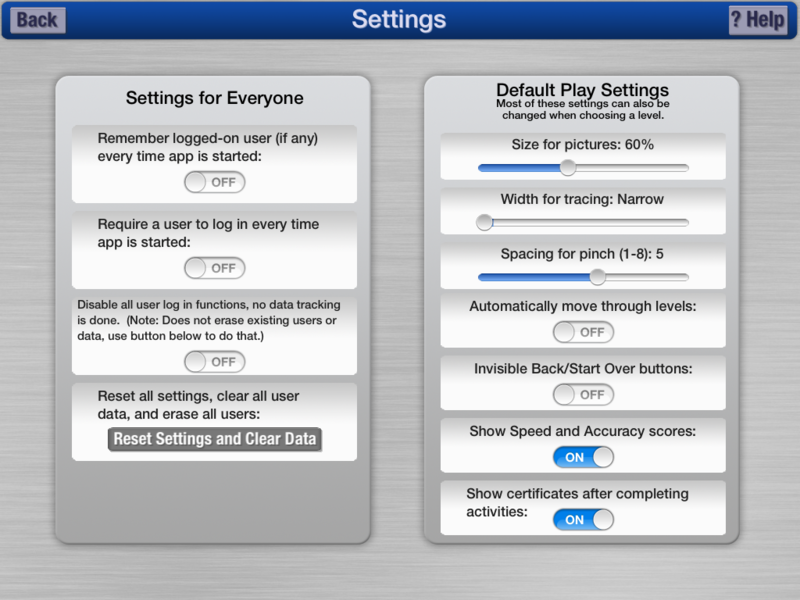 Here are the default play settings that allow the customization for path width, size of pictures, pinch spacing as well as ability to show or hide features of the app. The app also provides speed and accuracy scores for touch, paths, ordered touch, shapes, connect the dots, pinching and letter formation activities. Only capital letter formation are offered in the app, however as a pre-writing app, that is developmentally appropriate. A lot of work has gone into the development of this app. Collection of accuracy and speed is quite amazing as a method of collecting data on progression of skills. Although many students race through an activity negating the need for speed scores, the accuracy score will tell all for acquisition of fine motor coordination. Ready to Print provides the ability to customize the activity features and collect data for a case load of students – all at your finger tips on your iPad. I appreciate how the developer presents the app as a supplement to developing pre-writing skills knowing how important haptic and fine motor active activities are in the development of foundational skills of young children. More information is available on the Ready to Print website including an app video overview. 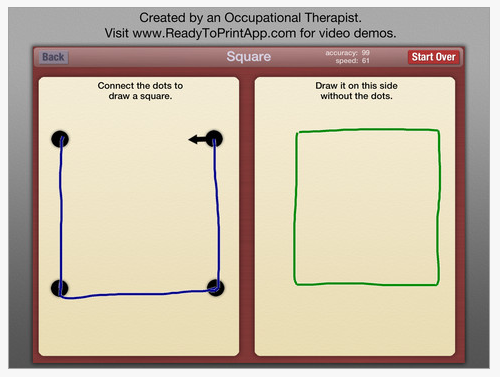 Congratulations to Diane Reid, OTR for creating a great, new app for your pediatric OT iTool Kit! In need of a stylus to use with Ready to Print? Consider HHI Chunky Pencil-Like Capacitive Stylus Pen – Aluminum Gold (For Kindle Fire, iPad, iPad 2, Motorola Xoom, BlackBerry Playbook, HTC Flyer, Samsung Galaxy Tab, iPhone 4, iPod Touch and All Touch Screen Tablets) for 2.99! I like the weight, feel and price! This entry was posted in App Reviews, Apps for OT's, AT for Handwriting, iPad, Occupational Therapy, Pre-writing, Uncategorized, Visual Motor and tagged App Review, iPad, occupational therapy, OT Apps, pre-writing. Bookmark the permalink. I agree with you. I think it is definitely worth the price! Lots of thought and customization!! Thank you for visiting Lauren! Diane, the other OT’s I work with really like your app! They are creating some comments that I will share soon on the blog. Thanks again for sharing!! What a great addition to an OT iTool Kit if you are working with young students! I purchased the app too 🙂 Will be using it tomorrow for the first time with some students on my caseload. Can’t wait to see how they like it. 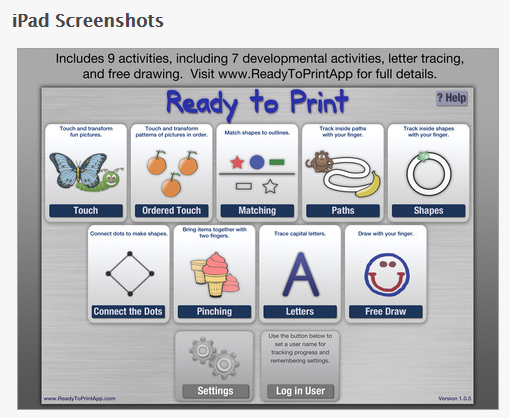 I have been using Ready To Print in my Occupational Therapy Practice since last year and I am thrilled by the enticement that it has for my wide range of 3 yr. old special need pre-schoolers up through my middle and high school special needs students. The variety to use tracing, copying, pre-writing, and fine-motor coordination skills including visual tracking has many developmental levels. Excellent app. Thank you for your comment. Ready to Print is a great app. The OT that created it really did a fabulous job! It is nice to know that you are using it for a wide variety of ages!